This tapestry 'Grapes and Chocolate' is based on the work of Acorn Studio. 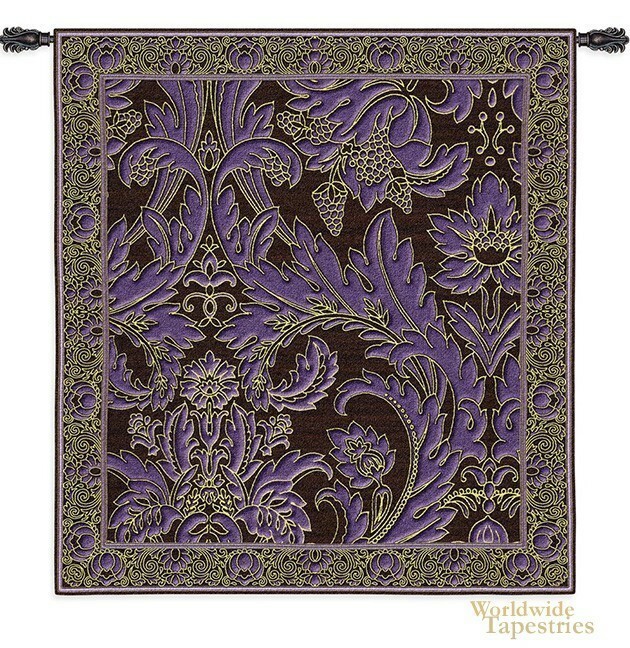 This work features a rich arrangement of two powerful colors of grapes and chocolate, and in a motif that is reminiscent of acanthus leaves and exotic flowers. It is in effect a fusion of traditional elaborate elements and modern use of color and contrasts. This work will suit any room or home requiring an infusion of color and modern art. This tapestry is backed with a lining and tunnel for easy hanging. Note: tapestry rod and tassels, where pictured, are purchased separately. Dimensions: W 53" x H 50"